It was around 1988 when I came across Eel Pie Marine Centre. I was not long out of college and wondering where three years of studying photography were going to take me. A couple of friends had just moved into a workshop space in the boatyard so I went to visit them. Up until this point, despite growing up in the area, Eel Pie Island was just a place which featured vaguely in my head as part of the riverside vista; I had never ventured over the bridge before and certainly had no idea of its captivating history. As a 21 year old, still full of the 'I can do anything' exuberance of youth, Eel Pie Marine Centre looked fantastic - and indeed it was; an intriguing mish-mash of boats, boathouses, dry docks, slipways and sheds; and that was just the structure. The eclectic bunch of boaties and artists occupying this place were even more haphazard. Eel Pie Marine Centre was set up by possibly the oddest of the bunch, Henry Gastall. A man of dubious dentistry, big glasses and extremely filthy feet complete with webbed toes, Henry acquired the yard in the mid 1980s with the aim of creating "little spaces for people to work in alongside the boatyard activities." My first studio space was a section of attic above the boatyard, also occupied by a stone-carver, a painter, a sculptor and hundreds of huge spiders. I didn't mind the spiders, but it soon became apparent that this was not the space for any sort of photographic endeavours. Extremes of temperature and dodgy ladders weren't really conducive. I soon moved to a downstairs space with a couple of other photographers and have as many memories of doing the place up as actually working in it. What was basically a brick shell topped by a tin roof eventually became a usable darkroom and studio space. I once heard somebody describe E.P.M.C as 'the devils' playground', to which Henry replied in his Aussie twanged drawl "No, it's an adventure playground for adults". To a large extent it was; in pursuit of the perfect studio I learnt to lay a wooden floor (using boards Henry had procured from legendary venue, The Clarendon in Hammersmith), installed a heating system consisting of a wood burner and some spirally greenhouse radiators and added to my skills a bit of bricklaying and wiring. Henry provided the materials and some instruction and you just got on with it. It was great. There was room to grow there. Over the years the boatyard evolved to a sizable complex of studios and workshops, and complex it was - like a maze; doors here, stairs there, all sorts of odd folk tucked away in nooks and crannies working on this that and the other. The mixture of people that came and went, or came and stayed was fantastic - from eccentric toffs to the criminally insane with everything else in between. It was aptly described by my friend, graphic designer Guy Campbell as 'An oasis of chaos in a desert of suburban calm.' 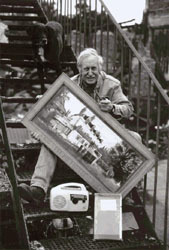 Somewhat like Arthur Chisnall before him, although apparently unaware of Arthur's legacy, Henry Gastall sought to create a nurturing environment, particularly to people who needed a step-up in life. He employed the disabled and disadvantaged and provided the means for people to improve their surroundings and themselves. I spent the next few years having a ball, (and changing career to become a leatherworker). Going to work was great. Many lasting friendships were formed through the boatyard and the sense of 'family' was very strong. There was a fantastic mix of talents and personalities with almost every type of creative endeavour taking place alongside traditional boat-building crafts. The symbiotic exchange of skills and pooling of abilities meant that almost anything was possible there. Oh, and we had some great parties too, from organised events, to the frequent impromptu gatherings round the barbeque or bonfire in the garden and regular late night post-pub get-togethers in someone's studio with Mike the stone-carver spinning his fantastic collection of soul and rare grooves. I remember, to begin with, some of the island residents looked down their noses at this bunch of arty types occupying the boatyard. We cycled (heaven forbid!) on their footpath, looked like we had just come from a festival and appeared to be doing very little. But, after a few years we all organised an 'Open Studios' weekend and many residents came, saw the quality of work being produced and became more respectful. By the mid '90's many of the businesses in the Marine Centre were thriving. Well established in our various trades, we had a blossoming reputation for high quality work and it felt as if everyone was on the verge of great things. The environment was dynamic, nuturing and very special. 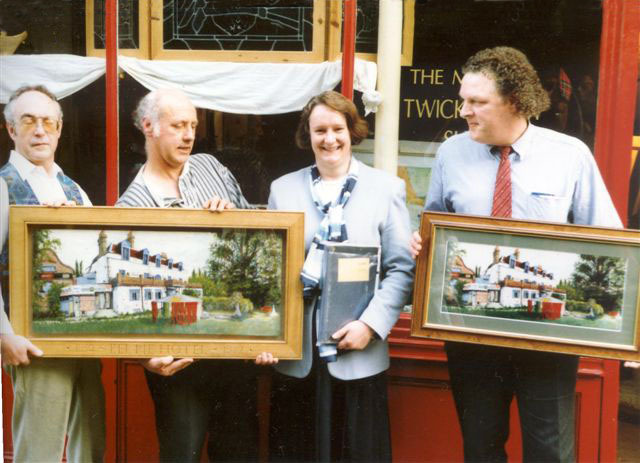 In early 1996 a shop, Par-ici (that I now run) had been opened a stone's throw from the island specifically to trade in local wares and many of us were selling our work there. Then disaster struck. In the early hours of Sunday 3rd November a huge fire swept through Eel Pie Marine Centre. The timber buildings were quickly engulfed by the soaring flames that devoured the many gas bottles used for welding and heating, causing an explosive atmosphere that was incredibly dangerous for the fire crews to enter. By dawn all that was left was a smouldering heap of burnt out livelihoods. Most people had been partying at one of Trevor Baylis's legendary bashes so at least nobody was injured or worse, in the fire, but the reality that greeted us all the next day was shocking and sobering. My new baby son, Louie, was six weeks old at the time, so I was at home rather than at Trevor's. I was woken at around 4am by some friends who told me, 'Come quickly, the boatyard's on fire'. I went and stood in disbelief on the Embankment and watched as the place went up. I had my biggest ever order, for 300 suede baseball caps, half-finished in my workshop. The next day all that remained were the metal stairs that once lead to my door. The fire received considerable media attention from television and press due to the fact that it was the biggest blaze the area had seen for a long while and also because of Eel Pie Island's earlier notoriety. Within twelve hours an appeal was launched to find offers of help; workspace, tools, materials and financial aid were all requested. The back of Par-ici became the Appeal Office and help came flooding in, both monetary and practical, from supportive locals and also sympathizers further afield, including Genesis drummer Phil Collins (who's dad apparently helped to build the Richmond Yacht Club on the Island). The Eel Pie Trust was formed a week later to give full legality and accountability to it all. Over the following weeks all manner of fund-raising events were organised, including gigs, raffles, theatrical productions and an auction of over one hundred lots consisting of a fabulous array of donated items; Appeal T-shirts signed by the likes of Joanna Lumley, Sting, Daly Thomsom, Dawn French and Lenny Henry, Trevor's Wind-up Radios, art and craft works of all descriptions, along with offers of time and skills all went under the hammer at the event held in The Stables at Orleans House Gallery. All told, the Eel Pie Fire Appeal raised in excess of �40,000 which was distributed according to need to assist in rebuilding lost livelihoods. Arthur Chisnall, who had become a friend through me researching the book about Eel Pie Island, got involved with some of the work the Trust was doing. I remember him gleefully saying to me "I've been waiting twenty years for you lot to come along!" Over the months that followed people gradually re-established themselves, but obviously not all back on the Island - the heart and soul of a unique place had disappeared in the flames and the site was now under threat from the omnipresent developer. What the blaze left was a kind of 'L-shaped' part of the site virtually unaffected by the fire, and a large central area that was a heap of ash and rubble with the odd just-recognisable bit of machinery within it. The Eel Pie Trust moved onto its secondary aim, which was to secure the site (in terms of not loosing it's B2 classification of boatyard/ light industrial usage) and possibly rebuild what had been lost. After many meetings with potential 'sympathetic developers' and hours of research into costing and feasibility the Trust was forced into a battle with a decidedly unsympathetic developer when the land was sold. Thankfully divided into two lots, the remaining boatyard and studios in the 'L-shape' was bought by four previous tenants and to this day it continues to be run by Mark and Helen Montgomery-Smith in the same welcoming, working manner as before. Boats are still craned out of the water for repair on the hard-standing or in the dry dock, and an atmosphere of creativeness thrives there. The yard still smells of diesel, paint and varnish and hums to the sounds of proper hands-on work. After countless hours spent attending Council planning meetings and writing letters of objection, Trust members, residents of the Island and beyond, lost their cause when the burnt out part of the site was eventually developed into a gated, sterile luxury office complex, with all evidence of light industrial and boatyard use forever gone from a place where it once flourished. All who knew this site before concur that what has taken its place is entirely out of keeping with the Eel Pie spirit. Offices can be built anywhere, boatyards cannot; and sadly Twickenham is all the poorer for this loss of part of its riparian heritage.